Chapter XXXIII: Sword and dagger. The manuscript treatise by Giovan Antonio Lovino does not get the attention that it deserves. This richly illuminated work can be dated to about 1580, is written in Italian, and is conserved in the French National Library under the index ‘MS italien 959’. 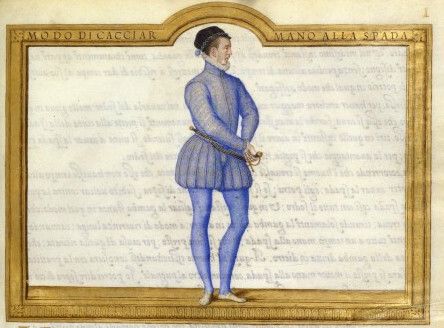 Lovino was a Milanese master who dedicated his work to the king of France Henri the third. He claims to have a fairly long professional fencing experience of 22 years. It is likely that he hoped to gain the favour and interest of the king in order to get a teaching position or even compose a larger, extended book to which he alludes in the manuscript. We do not know what happened upon the reception of the manuscript, and no other work by the master has surfaced. 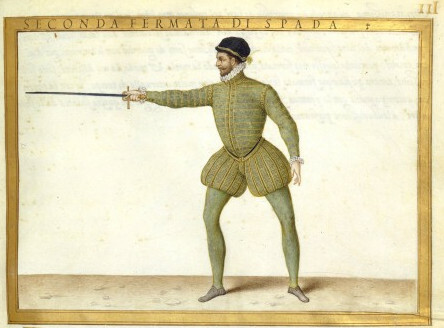 Italian fencing was very fashionable at that time in the French nobility, so it is not so surprising to find a work in Italian dedicated to a French king. 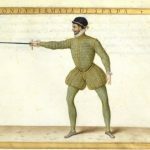 Milan had some popularity in terms of fencing, being home to several masters who we know by name, but have not found the work of yet. The city is also mentionned in Brantôme’s Discours sur les duels as a good place to learn fencing – but then, most Italian cities were. I’m aware of only one English translation of the work, but it is based on an extremely abridged French edition which does not do the work justice, as it ommits the majority of the text and includes only low quality black and white images. There is a much better transcription and translation to French, that has all the text but only tracings of the images, as the cost of including better original images was too high for the authors. The work is split in two parts. 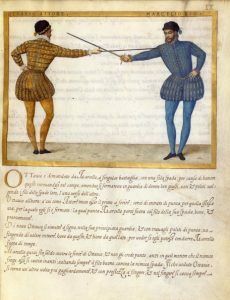 The first is a series of illustrated plays, covering many weapons and combinations: single sword, sword and dagger, sword and cape, sword and buckler, sword and targa, sword and rotella, two swords, longsword, two-handed sword, a short spear or pike, and even combat against two and fighting against a rider. The second part is a dialogue between Lovino and his sponsor, about a variety of fencing topics. Each part has a number of original and valuable features. Throughout the work, Lovino uses vocabulary that can be seen elsewhere (names of the cuts depending on their trajectory, for example), but also words that I have not seen elsewhere. An example is the use of scodere (to shake) for the action of freeing the blade from an engagement, and frequently calling cuts in general coltellate (litterally ‘knife cuts’). These can be seen as evidence that he belongs to his own tradition, although all share a common basis. 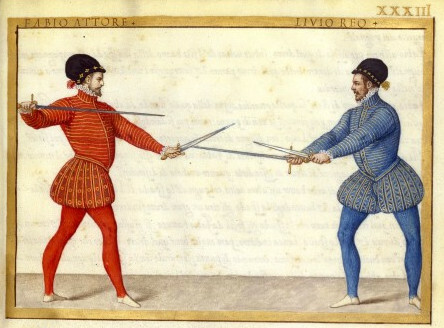 Technically, Lovino stands at the transition from earlier styles to rapier. He has a strong emphasis on sword alone, then sword and dagger, uses simplified guard positions, and puts an emphasis on finding the sword and pursuing from there. On the other hand, he uses cuts liberally, exposes many weapon combinations, and has more close play and wrestling than later rapier treatises. 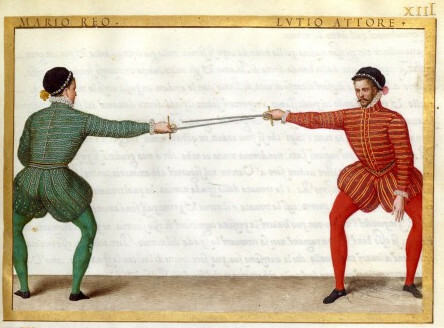 The swords illustrated are also shorter than the typical Italian rapier of Fabris and the like, although it is always tricky to trust illustrations fully in that regard (the blades are invariably very thin, even for the two-handed sword). Being a transitional work is consistent with the tentative dating to 1580. A thrust to the shoulder. Controlling the opponent with wrestling. Blinding the opponent with the cape, thrusting to his leg. 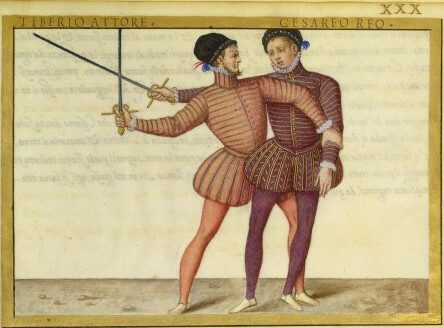 Ottavio is called by Marcello in single combat with the single sword for a matter of honour. They meet in the specified field, and place themselves in the inside ward, well adjusted, rassembled and careful, turning the edges of their swords against one another. Then Ottavio, as the agent, seeks to hit first. He tries to enter with the point through the same way he is already placed. Marcello carries that point outside with the edge of his sword, well and promptly. Again Ottavio takes his principal ward towards his target and, with great work, goes feinting with the point sometimes on one side, sometimes on the other, to see if he can drive Marcello outside of time. Marcello stands solid against the feints of Ottavio, and does not believe in them. To the contrary, he always turns the true edge against the opponent’s sword as the feints advance. He sees Ottavio turning a feint this time with more vigour and speed, advancing even further. Marcello still reacts in a similar fashion, always carrying the point outside with his true edge as the ennemy advances. 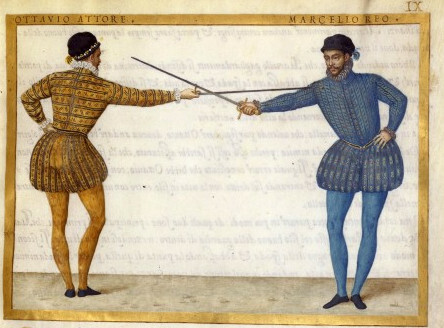 Then Ottavio, seeing that Marcello defends himself vigorously, decides to find a way to strike him. With this thought, he lowers his sword and body and uncovers himself so that Marcello could follow him and strike. But his previsions are deceived, because Marcello pursues him with the point from the outside, seeking the body of his opponent. Here Marcello makes a mistake. 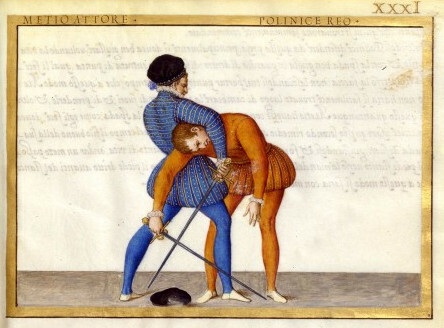 Wishing to pursue Ottavio, he should advance justly, and turn his true edge against the opponent’s sword. Thus he would have been assured that Ottavio’s sword could not hurt him. 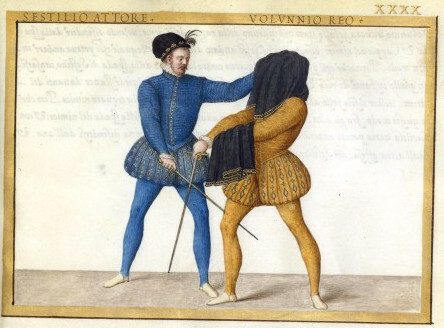 As soon as Ottavio realizes the mistake, he quickly assumes the inside ward and enters on the right with the body profiled, and pushes a great thrust in Marcello’s shoulder. Such a thrust can be parried in a few ways, here are the main two. The first is that Marcello should adjust quickly the true edge of his sword in the inside ward, profiling his body behind it. The second is to lift the sword hand, and lower the point, carrying the opponent’s sword towards the ground outside of your presence, going a little bit forward and to the side, following with the left foot behind the right. In these two fashions Marcello could have defended himself from such a thrust. 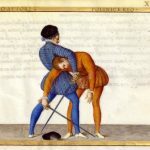 Should anyone want to make a public HEMA display that is paired work, but not a sequence of disjointed techniques, Lovino’s fights are a very good source. With 66 chapters to pick from, there is a wealth of material there. 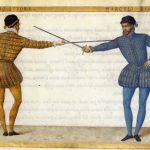 It also provide a historical source for a study of how to feel out and adapt to opponents, putting techniques in context, something that is often lacking. It is, as far as I know, a presentation format that is unique to Lovino. Lovino’s work is decidedly not a manual, that would guide you step by step to learn the whole art, as Thibault’s work intends to be for example, even though there is some progression in the successive plates. The inclusion of the pedagogical progression is very informative in that respect and gives a useful hint on what the historical syllabus was like. It compliments the plates in a sense. The description of the way to hold the sword is one of the most thorough that I’ve seen in such early works. It is not completely unambiguous, but far better than nothing. It insists on the need to have a tight grip with the bottom two fingers, and on the usefulness of a secure grip in order to resist disarms. it is done such that the point of the opponent’s sword is out of your presence, and the point of your sword is in the presence of the opponent. It seems to involve fairly more contact and pressure than you’d find with the later use of the term, though, especially in Fabris who prefers to find without making a contact at all. In Lovino the finding is often accompanied by a significant pressure that can take for example the sword from a high line to a low one. Lovino was included in the 2015 Wiktenauer fundraiser, which blew past all of its stretch goals. Sadly, it seems the fundraiser scans are going to be the very last thing made available. Hopefully getting access to the full original content will boost the popularity of this rich treatise! 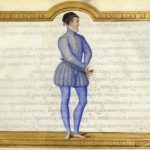 It seems like 16th century sources are neglected in general by the historical fencing world. 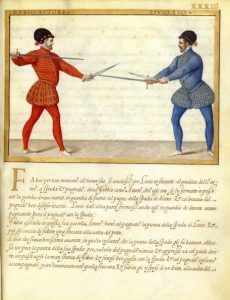 When I was in that world, the Bolognese community was pretty small, whereas every event had workshops or tournaments for 15th and 17th century martial arts. The 19th century historians who praised Marozzo and Capo Ferro, and the late 20th century revivalists who turned to I.33 and the 15th century manuals because they were older and therefore purer, cast a long shadow … although maybe the higher skill in languages required to read long books than short glosses has something to do with it too. I do also think that 16th century sources in general are stuck between the “medieval” and the “modern” and that this hinders their study. 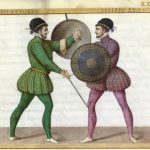 On the one hand you have the early sources which connect very well to the fantasy of being a knight and battlefield usefulness (however incorrect these perceptions might be), are very short and somewhat cryptic which gives a lot of leeway in terms of interpretation, so are easier to start with. 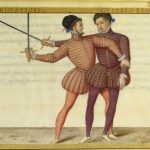 On the other hand you have the rapier and sabre systems, which actually apply very well to the 16th century swords, are extremely clear and detailed, and are a lot more distilled for the same applicability as 16th century works. The Bolognese walls of texts with very few pictures have trouble to compete on many aspects. 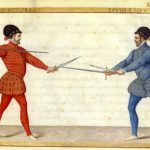 They are hard to digest, the weapons are not those of the ‘knight in shiny armour’, and ultimately even when I try to fence Bolognese I’m attracted to rapier or sabre solutions. It is hard to forget the future, in a sense. Short 16th century works like Sainct Didier are not really giving a complete system, so you have to step out of the source very quickly as you try to apply it. The availability of sources is going up, so I think eventually these works will get more recognition. Indeed, “rapier is a style, not a weapon” would make a good blog post! You can use a circa 1600 pokey English sword with any style … someone trained by Salvator Fabris might have better luck than someone trained by Hans Leküchner, but someone in his tenth duel or tournament might have better luck than someone in his first. I was never the kind of fencer who claimed to practice half a dozen martial arts … life is too short and I am too clumsy. 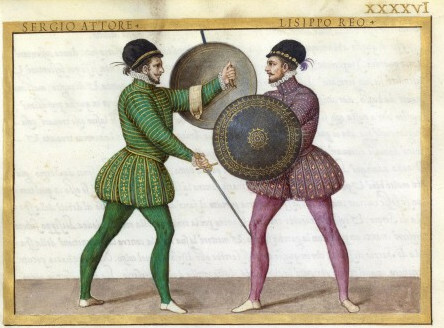 So I liked Fiore and the 16th century Italians because they were clear and comprehensive, and not so weird aesthetically and in weapon choice as 17th and 18th century martial arts or Destreza. 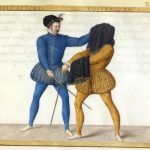 It might also be that some of the 16th century Italian sources hint at what a friendly fight in front of an audience should look like, and its not the kind of ‘hyper-violence’ which is fashionable today. 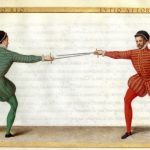 They took the opportunity to be playful and flamboyant and risk things which they would never try in a duel. I am always glad when you find time to post! It is hard to talk about martial arts in writing, but you manage to do it without falling into cliches.